Do you want to improve the farming production in Minecraft? This modification has been developed to do that. 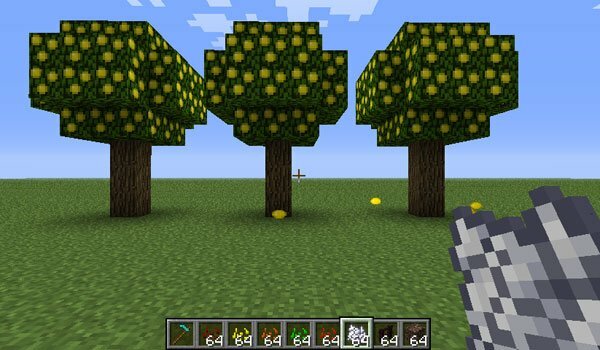 Better Farming 1.6.2 and 1.5.1 is a modification that adds, at first, three types of trees like the apple, lemon & orange tree. Obviously you can collect the fruit of this trees, and make fruit juice. Furthermore, the mod also adds new food and and a new crop as mint, with which we can make a mint tea or combined with chocolate to enjoy mint chocolate. Using cocoa make chocolate bars, hot chocolate and milk chocolate. Finally we use a new tool, the rake, which will help us to get seeds of all food that adds the mod, always we use it on the grass. In this case the best rake is gold. How to install Better Farming Mod for Minecraft 1.6.2? How to install Better Farming Mod for Minecraft 1.5.1?